I’m not sure you can ever really leave home. I never did. And though the physical place where I live is different than it was when I was a boy, the idea of home is both a memory and a surprisingly tangible part of my life. Some of my home returned today. And though at first I questioned its appearance, I realize now how much I really missed it. Here’s the story. While my mom was somewhat tonally “challenged,” my dad had an amazing singing voice that developed with little training. Well before I was born, mom and dad bought a piano although neither played. It was, as I see it now, more than a gesture of faith. It was a gamble—no, an unspoken conviction—that their only child would know how to use it. And so, at the age of four, they decided to test the theory that there might be some talent behind my banging on the piano. Petra Odeman was my first piano teacher. She was a wonderful person and, I think, knew that real music isn’t in the notes on a page. Music is something in the heart that awakens our spirit, our love, our lives. At just four years old, I could read the notes on the page, but not the words beneath them. Elementary school would fix that. Petra married the love of her life and moved away but not before planting that seed of music in my head. My next teacher (his name was Gene) was an unusual man, sort of hung up in the composers of the day who, to be quite honest, didn’t quite measure up to the notoriety they mustered. They were quirky. Dissonant. Jarring. He played their music precisely and without emotion. Despite their complexity, I could sight-read most of them and fake a piano lesson with aplomb. Instead, I preferred to play my made-up piano pieces for Gene who, honestly, preferred his music books to my compositions. I learned an important lesson from that: Sometimes creativity is scoffed at. That didn’t shake up my life, but it shaped it. Fast forward through grade and high schools, two years of college and an international traveling music group. Here I was, this musician who played the piano, the large, cumbersome instrument that takes at least two people to move. Not the best choice if you want to play for others in the park or on a date. I needed a guitar. All self-respecting musicians should master the instrument of strings and frets and convoluted finger positions that John Maher so adeptly conquered. At least, that’s what I thought. There were no dealers close by, so I drove an hour or so to seek out a standing ovation guitar that would woo and charm friends and others. The music store was large—packed with instruments of all sorts—and overwhelming. To get to the guitar section, you had to walk through keyboard instruments of all types and natures. It was a Steinway grand piano that caught me eye. She was a charmer with a rich walnut finish and white keys that seemed to dance in the light. I don’t know that you fall in love with pianos unless you are a musician. I do know that you fall in love with what brings you happiness—even though, in the case of a piano, you can’t really “return” that love except by playing it and fulfilling its purpose of inspiring and lifting others. My love affair with the grand piano was born. 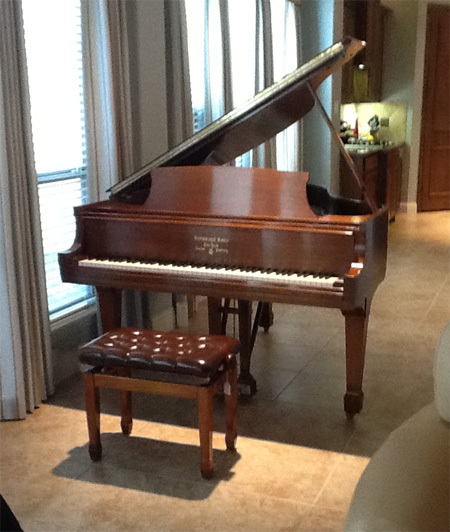 Without talking to my mom and dad, I traded the piano and organ (yes, the collection of musical instruments in the house had grown) for a grand piano. And, at a mere 20 years old, I owned a hunking grand piano financed by a job in a hardware store. So much for the portable standing O. Fast forward another few years… The piano became an important part of my life and who I was. Music defined but didn’t bound me, I finished college and took on respectable jobs to pay the bills and venture into the world. Then my work took me to a small place on the East coast that simply couldn’t accommodate the piano. It was comfortable space. I got out of debt. But the piano remained in storage. It simply wouldn’t fit in the condo. Today, after moving three months ago to a big town in the lower states, the piano, in storage for 12 years, was delivered to my new house. At first, I was bothered by its size and how it imposed on the room. Furniture had to be rearranged and space had to be rethought. But when I sat down at the keyboard after a dozen years of being away, I know it was meant to be here. It reminds me of years long passed—of mom and dad and the telling of the Steinway story. It is meant to be, as are most things that make us happy. And now it’s home. I has always been there in my heart; it’s been out of sight. No more. Music does that, whether we sing or not. Sometimes we need to sing. At other times we need to listen. Sometimes we play. All gifts are important. A bit of a 2014 update: In a few days, almost two years to date from its last move, the special piano will return to its hometown in Washington state to become part of a dear church’s loving ministry of hope, love and healing. Music comforts. Music includes. Music heals. And that, for me, has been the piano’s purpose and contribution all along. How will you and I be a contribution? Your blogs are always among the most interesting I read. I hope you are doing well and are happy.